Welcome to the tri-centenary celebration of life on Old Earth. Item 1: Wooden desk, whitened with paint to disguise the murder of a tree. Item 2: Plastic writing implements to poison the oceans and scribble out fish. 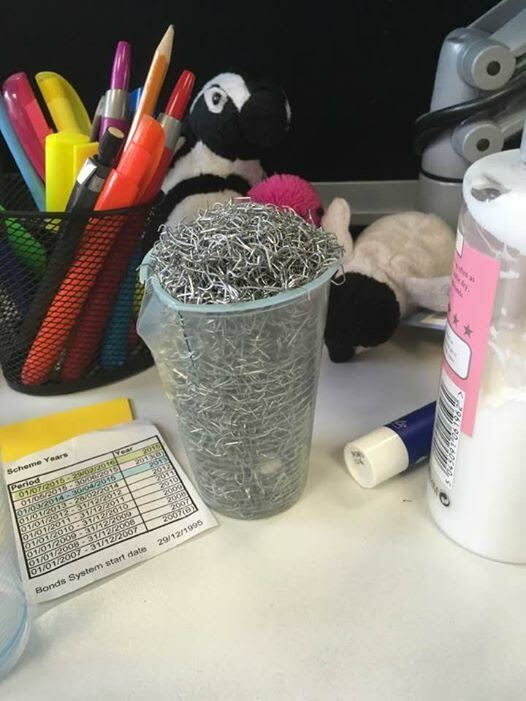 Item 3: Metal paperclips to imprison tree-paper. Item 4: Sticky substance to glue tree-paper to tree-paper. I would laugh except it’s too close to reality. Do you know it is practically impossible to shop for necessities and not buy plastic? Of course you know…and how ridiculous is that? We are a disposable society which does not care about the damage being done. Hopefully we’ll turn it around before it is too late. Thanks for the truth, my friend! In the UK, our campaign for reducing packaging and giving people incentives to recycle plastic bags is working fairly well, but it still has a long way to go. Just so much is made of plastic? Where do we even start? I’ve heard somewhere that our time period will one day, most likely, be called the Plastic Age, if there are people around to call it that, of course! I wondered where you’d disappeared to this week, Bill, but I see that you’ve posted something two days later than usual 🙂 I will check it out tomorrow, as have to do a singing rehearsal in a short while. At least the human race is still around then, I have my doubts if we’ll last that long! Nice take Sarah. Thanks, Iain. If I’d had more than 100 words, you would have learned that the art installation was a virtual one in a spaceship called New Earth — not that I’ve written the next 60K words … yet, maybe. We do have a long way to go. Our village shops stopped using carrier bags a few years ago but so many people complained. Don’t you have bin liners that look and feel like plastic bags but are biodegradable? Where I live, we have recycling collection, too — bins for everything you can think of, so that any garbage that can’t be recycled usually fills one slimline bag a week. About a decade ago, it used to be 2-3 big sacks of garbage per week and driving miles to get rid of bottles, paper and cans, causing pollution en route. We even have new refuse collection vans now, that don’t belch out loads of diesel fumes! There’s still a long way to go, but it requires re-educating a huge number of materialistic short-sighted people. People love to complain about anything and everything … especially at the moment. They’ve got used to a “disposable” society, where products are subject to planned obsolescence., and things that were once luxuries have become necessities. As for carrier bags, I love my jute bags, which never split or cut into my fingers when they’re full of stuff. I love all my reusable bags. We have recycling here, too, which is WONDERFUL. I haven’t checked into biodegradable bags and should. We purchased a garbage can for the house made specifically for plastic sacks so that we could “recycle” them that way. My sisters send me bags from Colorado, they pack them around fragile things they send. I’m not sure whether this one makes me laugh or cry more. Loved the white paint to cover a murdered tree. 😀 Well done either way. Thanks 🙂 I seem to make a habit of writing stories which have that effect upon you, but then life is a real hodgepodge of emotions and sometimes there’s a fine dividing line between humour and sadness … we can be like April showers, interspersed with brilliant sunshine. My daughter’s constitutional homeopathic remedy during childhood was Pulsatilla, because her moods shifted so rapidly between tears and laughter. As for murdered trees, I have a particular love of trees and hate seeing them felled unnecessarily. My husband wants to cut down the old apple tree in my garden, but I’m being very resistant to the suggestion. When eventually it goes, I will insist we make a log pile out of its trunk and branches, so the insects can make a home for themselves and the tree continues to serve a purpose. You covered so many bases with this story. I love the 1,2,3 idea. Thanks, Alicia. …And there are so many more bases to cover, but not in 100 words! Like Rochelle, I want to cry. What a fabulous way to portray us evil humans and our destruction. Well done, as per usual, my friend! Thank you, Dale. The sad thing is that those who’ll survive will be those who can afford a place on the spacecraft out of here. It is also quite likely that those who can afford it, are those in power who have caused the destruction of the planet, or at least those who have allowed it to happen when they could have worked together to prevent it. Thank you, Varad. Sadly, such a day might arrive sooner rather than later, if certain people carry on as if the world’s resources are limitless. A very sad day when we have to look at the world like this… love the focus on tree… murdered trees that is something. A very sad day, indeed. As for the murdered trees, I’ve never forgotten one of my earliest blog followers telling me that trees screamed when they were felled. This was my kind of story telling. Sadly at present the food retailers are very very poor at recycling. Using so much plastic is just not on. If we turn the earth toxic, there is nothing out there to replace it. Nicely written story, Sarah. I think the penguins without deflector shields line was cute. As for the future, the truth will be far, far stranger. Thanks, Kent. I’m sure the future will be stranger, but how much humans can change and mend their ways is quite another matter. I often find myself thinking how lucky it is we haven’t learnt to travel faster than light and colonise other worlds, eventually wrecking them too. Penguins with deflector shields. Almost too horrific to imagine. Almost. Nicely done. Thanks, Sandra. I guess that penguins walking around with deflector shields would rather take the edge off their cuteness! Well done but you’ve painted a bleak world to come. I wonder what they have to replace the trees and synthetic products? I love this, sad as it is. Wish someone came up with deflector shields already. And about the plastic: where I live, there’ve been efforts and actions to reuse and recycle for a long time, and people make an effort but then comes agriculture and you wonder: why bother. They have these huge plastic tunnels where they grow strawberries. Other fields are covered with plastic sheets to grow them earlier and earlier. And they cover asparagus mounds (don’t now the expression) for earlier harvest. All these sheets get ripped and worn over time, and you find torn pieces all over the place. My dog digs for mice frequently and she’s dug out mouse nests that were lined with plastic. It’s not looking promising at the moment. Bacteria that eat plastic are around, but enhancing that ability and releasing them–new risk. Life on earth will survive, but will we? I’m pleased to say that we don’t use poly tunnels on our family allotment. The silly thing about forced food is that it doesn’t taste as good and is less healthy for the body. For instance, early strawberries are really sour. I still remember from childhood my mother’s huge cookery book by Mrs Beeton, in which there were foods for definite seasons and that provided suitable nourishment for the time of year, some of which could be cured, pickled, or preserved, if need be. But back to the plastic, that’s horrifying about the mouse nests. The same is happening with plastic beads in the oceans that fish mistake for food. According to James Lovelock’s Gaia hypothesis, there’s a good chance that the Earth will eventually treat humans as parasites and destroy us in self-defence. That’s an interesting hypothesis. In biology, the adversary is usually fought until it has a small enough population size to not cause fatal damage. If we reduced our population size down to that level, we’d be on a good way. I hear you on the seasonal fruit and veggies. Not only seasonal but also local. Exotic once in a while is OK, but you can find healthy ‘superfood’ locally wherever humans lived long enough. Kale is something that was considered grandma food when I was a kid. I remember once reading a really controversial letter that a science student had sent to National Geographic Magazine. I can’t recall all the details, but basically he said that you should allow the world’s starving to starve because the planet could only sustain a certain number of people and it was nature’s way of dealing with the problem. I love Kale but the snails are rather voracious where I live, so am not sure how well it would do homegrown. We’re just about to have our second crop of spinach this year, which I guess kids used to tolerate because of wanting muscles like Popeye the sailor man! Science student, my goodness. There are other ways to achieve that. Aren’t we supposed to be more developed than animals? Reducing the need for large families instead of social insurance, justice, jobs, birth control, education… of course the natural selection will hit us hard if we don’t take better care of the planet. My MIL used to grow Kale and it did well. We do have lots of snails, too, but they usually prefer tender lettuce. Perhaps that student has become less radical as he has got older. I wish I could remember the exact details of what he wrote. It was about 20 years or so ago now. Re lettuce, it’s the crows that like our lettuce. They got the first lot we planted this year but then we tried another variety and they left it alone. Perhaps we’ll give Kale a go. Sad but very true state of affairs! We would have to wait and see how long the human race lasts.. I think that depends upon some huge shifts in opinion on the part of those in power. In other words, we need some miracles, fast. Tragically believable Sarah – also very inventive. Wow! I believe that letter would have been controversial. Theories are one thing, or is he speaking from experience? Has he actually seen people starve to death? If his parents and siblings were starving would he think it’s an okay situation or would he be begging the international community for food? Nature is merciless; I see that every day in the woods around me. Really, it would be much more humane to just shoot the starving masses, or gas them. I imagine the magazine probably brought a lot of this kind of feedback after that letter, especially from people who’ve seen starvation up close. As I was saying in another comment, I can’t remember the exact details, as it was a couple of decades ago now that I read it (while sitting in the doctor’s surgery!). So I never saw the next issue, which doubtless had replies to his letter. If I had been replying, I would have asked him if it was justifiable for a lot of people in so-called developed nations to stuff their faces with twice the amount of food they need, while others starved. As for Europe’s food mountains — such criminal wastage… I could go on forever on the subject. Nature is merciless. Recently I read the novel “Micro” by Michael Crichton, which really drove home just how savage creatures are, even at a microscopic level. Sadly, I believe that if humans were pushed into a corner by some global disaster and had to fight for their survival, the most basic animal instincts would kick in big-time. Nature is merciless because it has no conscience. Humans do have one. I think if we were “pushed into a corner,” as you say, it would go both ways. You would see some people descend to the level of animals, in it for their own survival no matter who gets hurt, and you’d see some making very noble sacrifices because they believe in something more than mere survival. In Nazi Germany some people hid the Jews in spite of the danger to their own lives. There were instances even in concentration camps where someone sacrificed for another or did a special act of kindness just to rise above the evil. Like the farm girl who risked her own life to bring a Jewish boy an apple every day. I have a book, Three Came Home, written by Agnes Keith, a woman incarcerated with her son in a women’s POW camp by the Japanese army when they invaded Borneo. Her husband was in one for men and soldiers. There was incredible brutality, but also touches of the noblest in human kindness. You are right. There are many examples of wonderfully altruistic acts, self-sacrifice, and the taking of huge risks to help others in extreme circumstances. It’s a shame the Media has a tendency to report more negatives than positives, so in the end they encourage a cynical world view, or worse still, one full of paranoia, mistrust, fear, or hatred. We need to hear some good and uplifting stories. Surely that is part of balanced reporting! perfect for today!! Well done Sarah! Too much so, I fear. How I wish it wasn’t so near the truth, Cybele, but it needs saying.